After its annual break in August, the South East Area Committee (SEAC) resumed its monthly meetings on the 10th September 2018, with Rose Kenny attending as South East Area Manager. Ruairí McGinley (Independent) assumed the role of Chairman, after SEAC elected him to the position in July. He takes over from Cllr Paddy McCartan (Fine Gael). Proceedings began with a brief presentation on the Fitzwilliam Cycle Route by Joe Seymour, Director at Aecom consultants, and Christopher Manzira, Senior City Council Engineer. This followed a more detailed route presentation to SEAC in July. Non-statutory consultation will conclude on the 12th October (contact: fitzwilliamimprovements@dublincity.ie). It is envisaged that detailed design work will begin during October / November; procurement over the Christmas period; with construction to follow in Spring next year. Several councillors raised safety and car parking concerns on behalf of local residents. Both Cllr Frank Kennedy (Fianna Fáil) and Cllr Mary Freehill (Labour) referred to the divisive nature of previous cycling proposals before the committee. The Fitzwilliam Cycle Route will next be on the agenda at the November SEAC meeting. Helen Smirnova, Senior Executive City Council Engineer, presented a long-awaited report on proposed pedestrian and cycling enhancements to Sandymount Green. 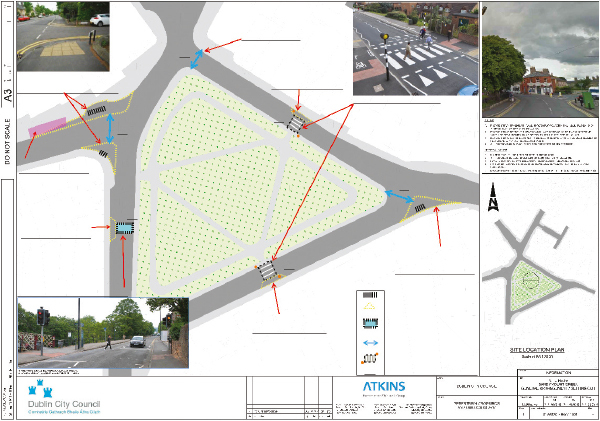 These would involve a signalised pedestrian crossing on the West side of the Green, and two raised zebra crossings on its North East and South East sides. The following items were raised under questions and motions to the Council. Cllr McCartan successfully advanced a motion that SEAC express its concern to the National Transport Authority (NTA) about the possible rerouting of the No. 1 bus, and the by-passing of Sandymount village. Cllr Freehill also passed a motion calling on the government to establish a department within local authorities to liaise with the NTA and communities on local journey patterns, share research materials, and to examine proposal impacts. The Chair read out an emergency motion from Cllr Claire O’Connor (Fianna Fáil) that SEAC write to the NTA, asking them to extend the deadline of the public consultation period for BusConnects. Cllr Dermot Lacey (Labour) placed a motion that SEAC request a report from the Area Manager on the conservation status of the old tramway sheds, yard and houses at Gilford Road, Gilford Cottages, Sandymount. He was informed that they were zoned Objective ‘Z2’ and are afforded conservation / protection under Chapter 11, Section 11.1.5.4, Architectural Conservation Areas and Conservation Areas of the 2016-2022 Development Plan. They are not, however, on the Record of Protected Structures (RPS). The Z2 Zoning Objective is considered adequate conservation protection for the area at present, pending a future assessment. Issues affecting cyclists and pedestrians have become increasingly prominent in councillors’ questions. Cllr McCartan asked the Area Manager to notify Dublin Bus about the incorrect spelling of Eglinton Road on routes serving the Donnybrook area, including Nos. 39a, 46a, and 145. He observed that the public intercom system also mispronounced Eglinton as ‘Eglington’ road. He was told that Dublin Bus were duly notified on the 13th August 2018.